The West Australian Mandolin Orchestra (WAMO) Inc. was formed in Fremantle over 40 years ago and continues to be Perth's premier mandolin and guitar ensemble. WAMO is a non-profit, community based orchestra comprising of instruments from the plucked string family - primarily mandolins, mandolas, guitars and bass guitars. The Orchestra perform a number of times each year in Perth and country areas. The musical director and conductor of WAMO is Robert Schulz. The repertoire is chosen from a wide variety of music spanning 400 years from Renaissance to the present day, and WAMO is proud of its reputation for performing new works by Australian composers. 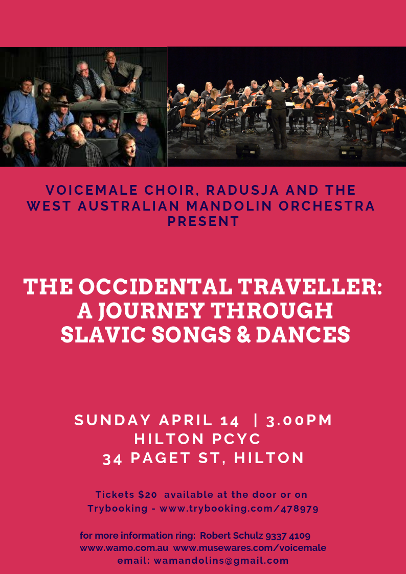 The Occidental Traveller : a journey through Slavic Songs & Dances.